09:00pm Train departs from Singapore (fare not included). 03:30am Arrives at Jerantut Station. 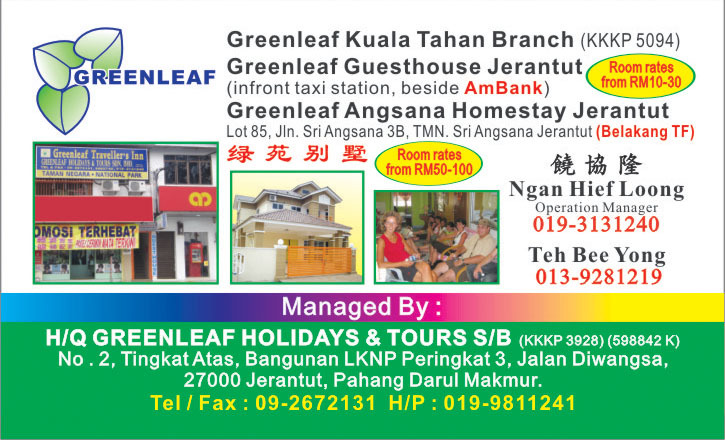 Check-in at Greenleaf GuestHouse / Angsana Homestay, Jerantut. 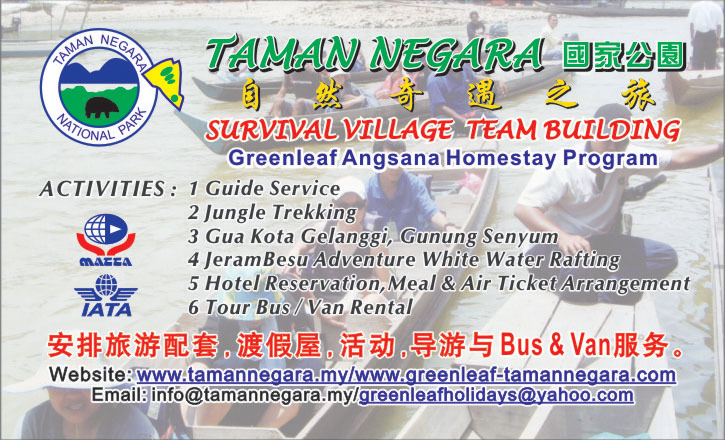 抵达而连突火车站,由专车接送到 Greenleaf Traveller's Inn 或 Angsana Homestay, Jerantut 住宿一晚. 01:30pm Excursion to Kota Gelanggi, bring along torch light. Eplore this 150 million year old historical and mythical caves complex and witness its unique flora, fauna and its magnificent rock formations which will definitely captivate you. 从 而 连 突 自 行 驾 车 出 发. 08:30pm Documentary Film that reveals the nature's gift to Taman Negara. 国家公园纪录片 (Taman Negara 自由活动 /拍照). 09:30pm Night jungle walk to Tahan Hide to see the nocturnal wildlife comes alive. Bring along torch light. 09:30am Jungle trek to Teresek Hill (344m). The peak of Gunung Tahan can be seen on a clear day from the hilltop. On return from trekking, you are invited to take on the longest canopy walkway in the world. It is 40m above ground and over 500m long. 走世界最长的吊桥 CANOPY WALKWAY 国家公园第一山丘 BUKIT TERESEK 了望大汉山的顶领. 09:00pm Free leisure or Night Safari on a 4x4 vehicle (optional). 09:00am Boat ride to Lata Berkoh waterfall. Enjoy the cool , refreshing air, and the natural beauty of our rainforest along the ride. Lata Berkoh 坐船 4 人一小船, 露天浴场瀑布,途中可看见五颜六色的天然岩石, 清澈见低, 手可触摸红罗鱼 (Ikan Kelah) , 在途中享受风光明媚的国家公园原貌. 12:00pm Transfer to Jerantut Train Station by coach. 01:30pm Arrive at Jerantut Train Station (packed lunch will be provided). 02:00pm Train departs to Johor / Singapore (own expense). *Drive own vehicles to our headquarters at Kuala Tahan. Enjoy the scenery of the wild jungles. Time saving and an opportunity to visit other places of interests. √ Things to bring: T-shirt, shorts, torch light, sport shoes, slipper or sandal, toiletries, drinking water, swimming suit, rucksack, shocks, insect repellent, poncho.